Gain a PADI certification and enjoy the third best diving destination in the world, as voted by Diver Magazine. 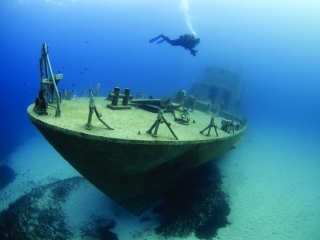 Immerse yourself in azure waters, amazing sea life, wrecks and reefs. The internationally recognised dive school offers the PADI Open Water for beginners and the PADI Advanced course for more experienced divers. The course replaces some afternoon activities.Open to all certified PADI Open Water Divers. This is the next step in the PADI chain for students to advance their diving experience and ability. Students can choose from: Peak Performance Buoyancy, Wreck, Multi-level, Photography, Naturalist, Dry-Suit, Night, Cavern, Nitrox. Unlike the Open Water course there is no final exam. However there are knowledge reviews at the end of every chapter in the manual which must be completed by the end of the course. If you’ve always wanted to learn how to scuba dive, discover new adventures or simply see the wondrous world beneath the waves, this is where it starts. The PADI Open Water Diver course is the world’s most popular scuba course, and has introduced millions of people to the adventurous diving lifestyle. The fun part about this course is . . . well, just about all of it because learning to dive is incredible. The PADI Open Water Course introduces you to breathing underwater for the first time (something you’ll never forget) and learn what you need to know to become a certified diver. This is an entry level certification in the PADI dive education ladder. Students who successfully complete this course will receive an internationally recognised licence to dive with an instructor or dive master to a maximum depth of up to 18m. The course is designed to get students in the water as quickly as possible so during the first two days the students usually spend time in class learning theory and practicing skills in the pool/confined water. Classes are held at the Dive Centre which is based at the Westin Hotel (down the road from the School). Once the student masters all the basic skills the instructor will take them out to do 4 dives in the local area. To optimise students’ classroom time with their instructor we encourage students read the books in their own time and classroom time is used for questions and developing concepts. Once certified the dive centre offers the students a free excursion (2 dives). In this way students can also experience different dive sites as well as meet other experienced divers. They’re what the PADI Advanced Open Water Diver course is all about. And no, you don’t have to be “advanced” to take it – it’s designed so you can go straight into it after the PADI Open Water Diver course. The Advanced Open Water Diver course helps you increase your confidence and build your scuba skills so you can become more comfortable in the water. This is a great way to get more dives under your belt while continuing to learn under the supervision of your PADI instructor. Open to all certified PADI Open Water Divers. This is the next step in the PADI chain for students to advance their diving experience and ability. Students can choose from: Peak Performance Buoyancy, Wreck, Multi-level, Photography, Naturalist, Dry-Suit, Night, Cavern, Nitrox. Course, online course materials, all diving equipment & certification. For the advanced course you will need 'Open Water Diving Certification' or equivalent qualification. Written notifications of cancellation must be submitted in order for refunds to be provided. All refunds are made to the original fee payer. Students cancelling prior to the start date of the course will not receive a refund. Students cancelling due to Medical Reasons will be given a refund, the amount depends on how many classes have been missed. No refunds will be given by the school once the student has started his/her programme.